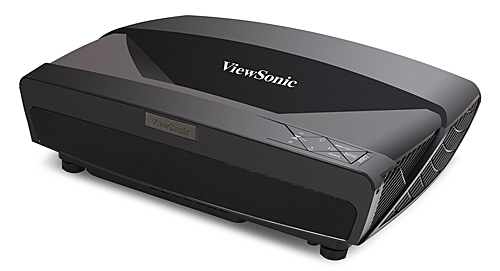 The ViewSonic LS820 is a full HD (1920x1080) 3D home theater projector with two killer features that fully justify its $2999 MAP price. The first is its ultra short throw, which lets you place it on a table within inches of a wall-mounted screen, run data and power cables to it with no more effort than connecting an HDTV, and have a far bigger image than you can get with any comparably priced TV--even if you include the price of a screen. The second is a laser-and-phosphor-wheel light source with a 20,000-hour life in Eco mode and a three-year warranty. Beyond that, the LS820 lives up to its 3,500-lumen rating, making it easily bright enough to stand up to ambient light in a family room, and it delivers far more than acceptable video quality with vibrant color straight out of the box. It weighs a hefty 22 pounds, but that still makes it a lot lighter--not to mention smaller and easier to install--than an equivalent large screen TV, and its handsome piano-black case will fit in a family room as any other consumer electronics device. As icing on the cake, the stereo audio quality is at least a match for most HDTVs. Two built-in 10-watt speakers offer both midrange and tweeter elements arrayed across the back of the unit, facing the seating area, the volume is more than enough to fill a large family room, and we didn't hear any distortion even at top volume. Picture quality ranges from very good to gorgeous, depending on the preset mode and lighting conditions. The LS820 offers five customizable predefined modes with no designated user modes. Despite minor variations, colors are well within a realistic range for each, so you can pick the one with the right brightness for the image size you want without seriously compromising color quality. Movie mode boasts Rec. 709 calibration, but our Video Optimized setting is Standard mode without changes, which is also the default. Skin tones and memory colors like grass and sky are on target--or close enough to it--in all modes. Color balance is a little off in some, however. It's excellent with ViewMatch sRGB, with fully neutral grays at all levels from black to white and nearly as good in Movie mode. Brightest mode shows a slight green tint at all shades but white, but not by enough for most people to notice except when watching black-and-white content. Standard and Dynamic modes also have a slight green tint, but it's even less of an issue than in Brightest mode. One minor shortcoming for theater dark lighting is that the contrast ratio isn't high enough to give the deep, dark blacks you would expect at this price. However, the 3500-lumen brightness defines the LS820 as being designed for ambient light, where the dark areas of an image tend to get washed out and the lack of a higher contrast ratio won't matter. The LS820 does well on most other aspects of image quality, holding both shadow detail and highlights well, for example. If you see rainbow artifacts easily, you'll see them occasionally, but with color content they show rarely enough and are fleeting enough that few people will find them bothersome. With black and white film/video they are a bit more noticeable as usual. The good news is that the single-chip DLP design eliminates any possibility of misconvergence, which is a potential issue for all three-chip light engines. Somewhat surprisingly, the LS820 lacks some video processing that's common in this price range, most notably noise reduction on the HDMI input and frame interpolation. Not having noise reduction for HDMI isn't much of a problem, however. I saw very little noise in our test clips and only in scenes that tend to show noise. 3D Video. The LS820 can switch between using DLP Link and Vesa RF glasses. To use the RF mode, however, you have to buy a third-party emitter. The image quality in 3D gets mixed reviews. On the plus side, I didn't see any crosstalk and saw only hints of 3D-related motion artifacts. Unlike most projectors, however, the LS820 delivers dramatically different image quality for 3D than 2D. Colors are notable less vibrant compared with any of the 2D predefined modes, and there's no way to change modes or customize the settings. The brightness drop for 3D is also a bit more than typical. Overall, 3D video is good enough to be watchable, but disappointing compared with 2D. Data Presentations. The LS820 can do a great job with data and graphic presentations. As with most DLP home theater projectors, its color brightness is a higher percentage of its white brightness than typical for DLP business projectors. That helps give data and graphics images vibrant color in all modes, and it makes full color images like PowerPoint slides brighter than you would expect with a DLP data projector with the same lumen rating. It also helps that the LS820 resolves detail extremely well. In my tests, white text on black was highly readable at 5 points, and black text on white was crisp and clean at sizes as small as 4.5 points. This is part of a very new and exciting category of device. With lower power consumption and long lamp life, it can also be a sort of ambient information window, displaying pleasant scenes and useful information much like a picture window while also providing light to a room. Of course, it's not quite there yet, there's too much fan noise to keep it running constantly. 2) "data" (which seems to mean "powerpoint"), ignoring education and interactive media and now very high resolution video games (video games dwarf film in revenue, and don't always require ultra fast response times). There are so many other possibilities in a projector central universe. 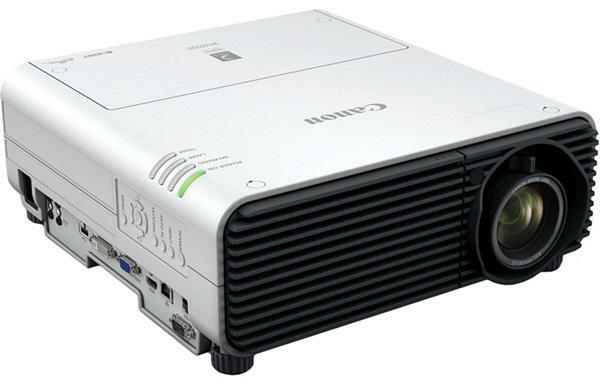 I hope PC plans on reviewing the new Optoma GT5500, it is a ultra short throw/DLP projector with high light output 3500 lumens, I am setting up a HT with an Elite short throw screen hoping for good performance after several years with an Epson 8500 in my old house. Given it is half the price and half the size of the viewsonic I would be curious to see performance comparison. Don't get me wrong ultra short throw and laser to me is the only viable future for the projector industry to survive in a growing OLED/LED size world I hope we are headed to UST with both laser AND 4K/HDR at the 3k price point, the viewsonic is definitely a move in the right direction but the major projector companies (BenQ, Optoma, Epson, Sony, JVC) need to get in the development game on this as well. Thanks for the review. I just can't stand rainbow effect so no way I could spend the money.